This month we caught up with Real Estate MA alumna Fiona Quinn. Following her graduation in 2009, Fiona soon found that the corporate world wasn't for her, and set her sights on becoming an entrepreneur. However, it wasn't until after two failed businesses that Fiona discovered the power of adventure and her entrepreneurial groove. Why did you choose Kingston to study? For me, Kingston just felt right. The town's location next to the Thames, with Bushy Park and Richmond Park so close is great. It has a lovely friendly suburban feel despite being just a stones throw from central London. Combined with the Centre of Excellence for my chosen subject, surveying, which meant great connections to industry as well as teaching and research at the forefront of sustainability within the subject. I knew from the first time I visited that this was where I wanted to live and study. For undergrad I studied Property Planning and Development. I'd always had an interest in property and this gave me a practical grounding in the business skills, theoretical knowledge and go getting mind set needed to develop a successful career. After my first degree I realised I was more interested in the numbers side of property than the planning, so I went on to complete a Masters in European Real Estate. One of the core skills I developed from my course, that is absolutely invaluable to me now despite the fact that I no longer work in property, is that of being able to present to a room. Standing up and delivering an engaging and compelling presentation, where the audience not only understands what you're talking about, but gets on board with your message is something that has enabled me to go far beyond what I ever imagined I'd do in my career. Initially after graduation, I started working in real estate but within six weeks I realised the corporate world wasn't for me. My skills lay in a more entrepreneurial way of working, where I get the freedom to develop and implement new ideas, while working flexibly, from both a time and location point of view. Over the past seven years I've run several businesses, developed a career as an adventurer, and have this year become the first woman to complete a length of Britain triathlon. I now work with brands to develop content and speak about the benefits of endurance sport for mind set, business and well-being. What are your best memories from your student days at Kingston? For me it's always about the people. Whether it's personal or professional, everything that we do in life is about the connections we make and relationships we build and Kingston was a great place to start developing this approach. From gathering support to become the Penrhyn Road Site Rep, to the sport social events and building lasting friendships across the industry. Have you been back to Kingston since graduating? If so, what for? After realising the corporate world wasn't for me, I went back to work as a researcher for 4 years in the same school at Kingston that I studied in. This was a great opportunity to develop new contacts across the industry and utilise my subject knowledge in a more innovative environment. I also helped the business school, mentoring students with businesses ideas, which always proved so motivating. They had such incredible drive and some really interesting ideas. What did you expect to do after graduating? Are you still doing that now? I expected to work in central London for a large corporate firm, most likely focusing on property valuation or investment and to rise through the ranks. After I realised this wasn't what I wanted, my career has gone in a totally different direction. I'm now my own boss and am working on a number of projects, from public speaking and writing a book to setting world records and running a book club business. I love the creative and time freedom that I have and really value the diversity in my working life. How did Kingston prepare you for what you are doing now? As I've mentioned, the ability to stand up in front of people and deliver an engaging talk has been invaluable. As have the softer social skills that I developed around networking, building meaningful connections and developing the confidence to not only share my own ideas, but also to put them into action. This was something that I didn't start off with and very much developed throughout my time at Kingston. This year I became the first woman in history to complete a length of Britain triathlon, which is a shining example of how self-belief has been core to my success. 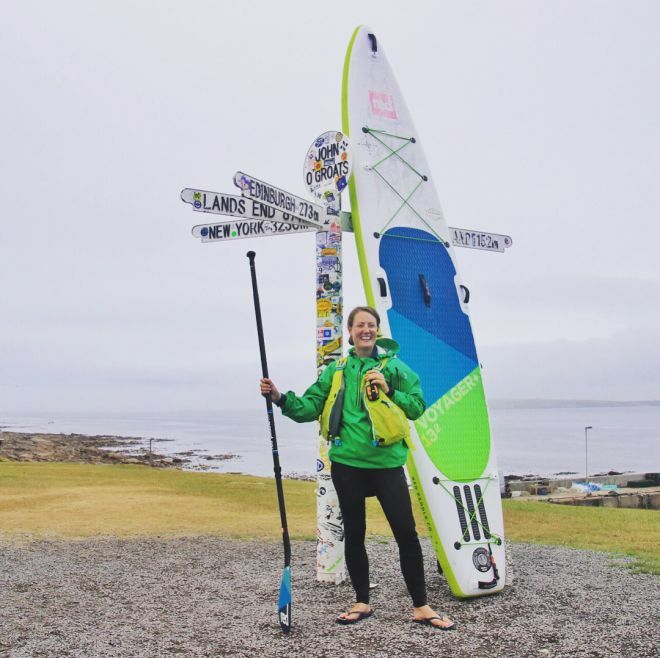 I started the water leg of the triathlon - stand up paddle boarding from Lands End to John O'Groats - without a skipper, a support boat or the cash to buy one. However, because I kept persevering, even when everyone was telling me to give up, eventually I found the support I needed and made it to the end, setting three world records in the process. Looking back I wish I'd sought more opportunities to try new things. I'm now much more open to failure than I was when I was younger, and as a result I've achieved a lot more. You never know what you're capable of until you try. Tell us something that no-one would guess about you? Despite having successfully stand up paddle boarded the length of Britain, I'm actually pretty scared of the sea! Find out about other Kingston University alumni we have caught up with.